Glamoursplash: Swimwear & Shaving - What a Combo? Swimwear & Shaving - What a Combo? 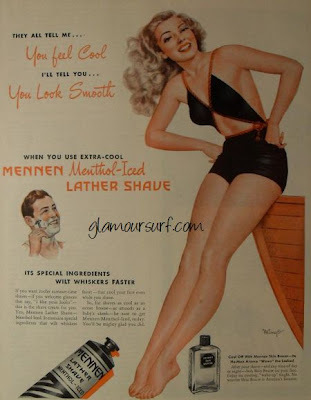 Well here's an interesting use of a bombshell beauty in a vintage swimsuit used in the 1950s in a Mennen lather Shave Ad. The only reference to the bathing beauty to the ad is in the very small print of the after shave. It says "Cool off with Mennen Skin Bracer - It's He-Man aroma "Wows" the ladies." The illustration of the man's face sure is ogling the bathing beauty though. Advertising aside, I really like the suit that's pictured. We have a very similar one from the 1940s in our store here. The open midriff was popular in the 1940s when manufacturers had to find ways to use less fabric in clothing in order to comply with war time restrictions. I think this was a brilliant design to that effort. The navel still had to be covered but the midriff, well that's another story. Cute hum? Very interesting about fabric restrictions, even in bathing suits. Good blog.